They say that it’s best to write what you know and let the bigger truths come from the personal ones. When Alan Bodnar, PhD, began writing for this publication’s predecessor, Massachusetts Psychologist in 1993, the plan was to shine a light on the life of a practicing psychologist and his relationships with his clients at institutions where he worked. Over the past 25 years, however, as hospitals and agencies shifted and expansion led to New England Psychologist, he discovered that his columns were helping him understand that he was talking about more than one professional’s experiences in and outside of the therapy room. 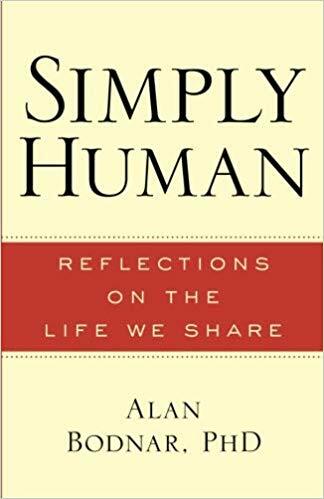 Dr. Bodnar compiled a sampling of these columns for a book, “Simply Human; Reflections on the Life We Share” (Bodnar, 2018). He found himself reflecting on how these small stories went beyond the therapist/patient relationship and beyond his own relationship with the world. As he explained to New England Psychologist’s Catherine Robertson Souter, the book encapsulated a growing realization that his years of individual columns coalesced into a message that is both timely and timeless. You retired in 2015 after 40 years working for the Commonwealth of Massachusetts. Tell us about the career you write about for New England Psychologist. I finished my Ph.D at Boston University and did a year of post-doc at Children’s Hospital and Judge Baker Children’s Center. I worked in outpatient children programs at the old Boston State Hospital and then at Solomon Carter Fuller Mental Health Center until 1990 when all the privatization of outpatient mental health services and closing of hospitals started. In 1990, the outpatient clinic I was working for privatized so I moved to work with adults with major mental illness for about a year and then they privatized that. I then had a chance to get back to working with kids at the Gaebler Children’s Center, the state’s only psychiatric hospital for children. That lasted for about six months and then Gaebler was closed. So, there was a period of 18 months where I changed jobs about three times. I wound up at Westborough State Hospital in October of 1992 and I was there for 18 years until it closed in 2010 and the whole department bumped into Worcester State Hospital where I was for the last five years of my career. How did you begin to write your column? As hospitals were privatizing around me, I observed what was happening with the patients feeling betrayed, abandoned, at sea. I felt a connection with these folks because I had been working with them and I was also moving around. I kept a couple of cardboard boxes filled with things I needed in the trunk of my car. I saw a metaphor there and so I wrote an article [for the Massachusetts Psychological Association newsletter] called “The Important Things” about the things we carry with us; the books, our papers, the materials we need to do our work. But most of all, it is our memories, affections, what we have learned, and what I hope our patients would carry with them even in this period of disruption. Denise Yocum, Ph.D, the former publisher of NEP, was just starting Massachusetts Psychologist and she contacted me and asked if I would write a column. What was the column’s focus at first? In the newsletter article, I wrote about the experience of being dislocated. I felt a small bridge of empathy with these people (and I say small because I am not equating my inconvenience with the life-altering disruptions that our patients went through). Denise wanted me to expand upon that in my column. She suggested we call it “In person.” The idea was to give the reader an idea of what it is like to work in this kind of setting or what the lives of people who are being treated in long-term settings are like through eyes of a psychologist. My column is often about being with patients and trying to understand what they are trying to communicate, what they are feeling, and helping them articulate it and make whatever changes they’d like to make in their lives. While you do that, you also have your own life going on. So, when someone is telling me about their sadness because a friend is dying three months after my own father died, I am thinking about that, too. And, you are monitoring your own feelings to see if any of these would be useful to share. You are always figuring out what is going in the room and what is going on in your head and when I write the column, I am trying to communicate that to the reading audience. Out of your 253 columns written in the past 25 years, you selected 66 for the book. Some are serious, some are humorous. Some detail interactions with patients and others with the world at large. Why these columns? Do they resonate more strongly with your personal life? Well, they all have something to do with my personal life because the point of my column is that it is through my own eyes, filtered through my life experiences. Maybe those are the ones where I think I have found the right words to communicate the bridge that connects my personal life with the experiences of the people I am writing about. We all have those bridges that we need to make with one another and that we can make with one another by realizing that our experience isn’t unique. One of the paradoxes of writing that I have learned is that the more personal you make your writing, the more universal the message. That is what I try to do. I am not out to write a textbook about the way relationships develop between children and parents. I am about this is how it felt for me and this is what I remember. 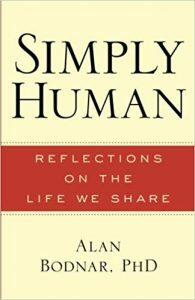 I want you to read it and let it help you connect with how you experienced those same human universal moments. I stress experience because I strive to write in a way that communicates how it feels to be in the situation and that prompts readers to be present to their own experiences in the same way. The metaphor that captures what I try to do comes from something I learned from a philosophy professor in college: I don’t want to tell you what you will see when you look out the window. I want to bring you to the window so you can see for yourself. What did you learn by putting this book together? Well, my work has reinforced for me the idea that we are all really more alike than different, as Harry Stack Sullivan, the psychiatrist, famously said. I wrote the book for the same reason I write the columns, to communicate that message to readers and not just as a message but as an experience that I had that will force them to think about their own experiences of connection with one another. And (I mean) not just with family and friends, but with everyone with whom they come in contact. Lord knows in this world we are living in now, we need more of that. Not that my book will supply it, but it is the little bit I feel that I can do. And it’s what we all need to find ways of doing. It sounds corny, but just to make the world a better place.